Instant stock and delicious hot drink. Gluten & yeast free. Makes 7.5 litres. Contains no artificial preservatives, colouring or flavouring. 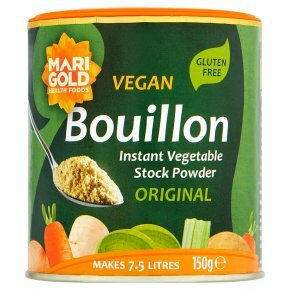 Suitable for vegetarians.The natural enhancer of all soups, stews, casseroles, sauces, savouries, rice and grain dishes. Also a delicious hot drink, instantly soluble in hot liquid. As Stock: 4 level tsp per litre. As Seasoning: Sprinkle lightly to enhance the flavour of all savoury dishes. As Hot Drink: 1 level tsp per cup of boiled water. A delightful beverage with only 12 calories per cup. Contents: 150g makes 7.5 litres.